This entry was posted on 10th June 2017 by Carol White. We are constantly in talks with the companies we work with to try to bring you great offers and deals, and are quite impressed with the latest one we have managed to arrange! 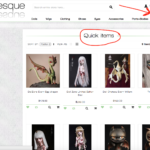 Doll Zone and Doll Chateau work closely together as companies and they sometimes over produce slightly when they offer event dolls or maybe someones order has been cancelled and they have an extra items that are for sale. We have now got a new category on the top line of the website that is offering these event dolls and items and if purchased the wait is a lot less than normal, they will ship within 4 weeks, so you will have your items very quickly indeed!